Freiburg, Germany – About 150 people heard testimony from nine American, British, and German veterans in Freiburg, Germany, on Saturday about the military members’ experiences in Iraq, Afghanistan and Guantanamo Bay, Cuba. 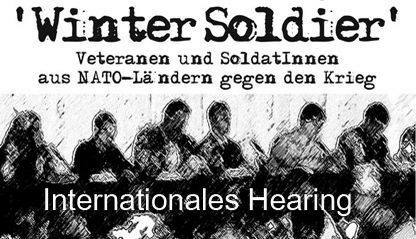 Entitled Winter Soldier Europe, the hearing was held just weeks before NATO’s annual summit across the border in France, providing an alternative perspective to the politicians, generals and media pundits. Martin Webster, a former British soldier who served in Iraq, discussed how he has coped with post traumatic stress disorder and how he believes governments that send their troops to war need to provide adequate mental healthcare when the soldiers come home. Christian Neumann, an active-duty German soldier who served in Afghanistan, explained how NATO is more dangerous than helpful as an ally for Germany. Chris Arendt, a former Guantanamo Bay, Cuba, prison guard, spoke about the abuse and dehumanization of prisoners at Gitmo. Eddie Falcon, a former US airman who deployed to Iraq and Afghanistan, talked about the treatment of Iraqis during his transport of prisoners, including blindfolding and strapping Iraqi civilians to the floor of the cargo compartment. The event was named Winter Soldier to honor a similar gathering 30 years ago of veterans of the Vietnam War. Winter soldiers, according to American founding father Thomas Paine, are the people who stand up for the soul of their country, even in its darkest hours. Media can receive high quality audio and photos of the event as well as photos of the individual testifiers on request.